Everyone has a story to tell, and at Orangutan Foundation International (OFI), the colorful tales are endless. Each caregiver at OFI’s Orangutan Care Center and Quarantine (OCCQ) in Central Borneo, has plenty of tell but for Ibu Ijun it’s just a story. “This is my life,” says ths woman with a twinkle in her eye. It takes some cajoling to get her to talk. At first glance, Ibu Ijun seems stoic and distant but her steady gaze is full of warmth and good humor. 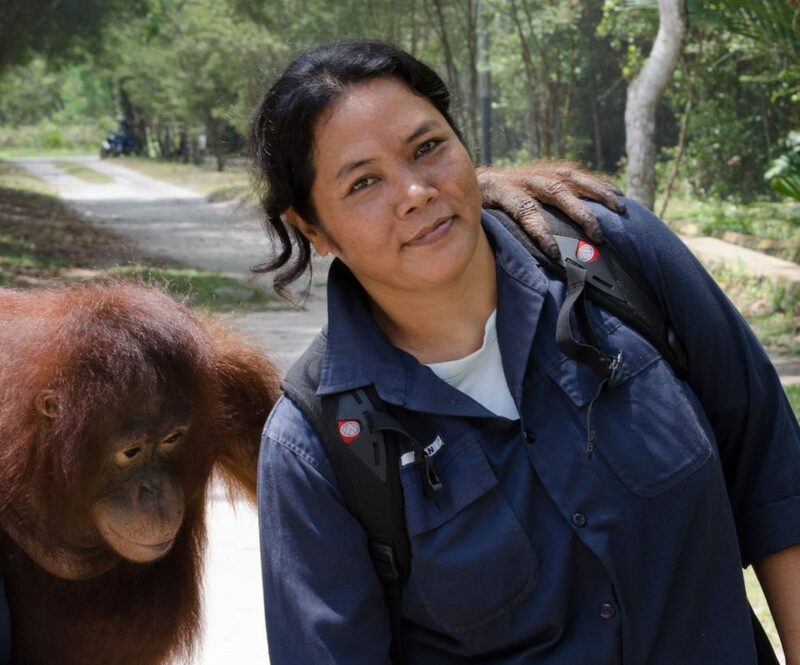 Ibu Ijun started working for OFI at Camp Leakey approximately 30 years ago as a cook. She has many happy memories from that time such as sleeping in her cabin in the forest and being awoken by a Malayan sun bear sniffing at her door. Fast forward to today and she is now the Coordinator at Pondok 1 (Indonesian for Hut) at the OCCQ where young adolescent orangutans are housed. Here she watches over the primates, assisted by a team of all-female staff. A typical day includes accompanying orangutans to “forest school”, feeding, cleaning their sleeping enclosures, and monitoring them. Ibu Ijun has taken many orangutans for their daily releases and prepared them for life in the wild. “I have no favourites” she insists, “they are all like my children.” No two releases are ever the same; one can never know how they are going to go. Ibu Ijun has had to deal with all types of orangutan personalities. She recalls recent soft releases with two female orangutans that seem a world away from the urban rat race. Marsha and Tiido, two adolescent females who love spending time in the forest, are the stars of this tale. Marsha is the investigative one, always hunting and sorting through forest flotsam and by her side Tiidois always there, forthright and self-assured. “We went out with the orangutans around 9am. Orangutans Tiido and Marsha love going into the forest and climbing very high. The orangutans all start off together and then disperse, going their separate ways. Marsha likes playing with Tiido and she follows Tiido a lot.” They may start out on the boardwalk but it’s not long before the orangutans head off road. “We sometimes head right out into the swampy areas!” Ibu Ijun remembers following her charges, her rain boots squelching through the mud. “In the late afternoon it starts raining, not hard, just a drizzle but it continues throughout the day and is enough to make the orangutans stay where they are high up in the trees. They don’t want to move. My fellow caregivers and I are getting wet. Water was coming up to here in some places,” Ibu Ijun says putting her hand up to her thigh. In lieu of a rain jacket with a hood, wash cloths or towels are often wrapped around heads to try and soak up some of the rain! Normally the orangutans are brought back to the care center in the mid to late afternoon, by 4pm. “That day, we got to 5.30pm and it was still raining. Tiido and Marsha haven’t moved for hours and it’s starting to get dark. Without light it can be difficult to get back or see where we are walking. We’re sure they’re making nests. Marsha is a skilled nest maker, so it looks like they are going to spend the night there together.” When this happens the caregivers leave the orangutans in the forest and return before sunrise the next morning to collect them. It can be a hectic trek back through the forest in the dark but luckily Ibu Ijun is prepared, bringing a flashlight with her. “So we are making our way back to the boardwalk through the swamp and that’s when we hear something; there is a crashing to our right. We see shadows up ahead on the boardwalk. We stop and try to make out what it could be. To our surprise it’s Marsha and Tiido. They are waiting for us! They had not wanted to move almost the entire previous day. 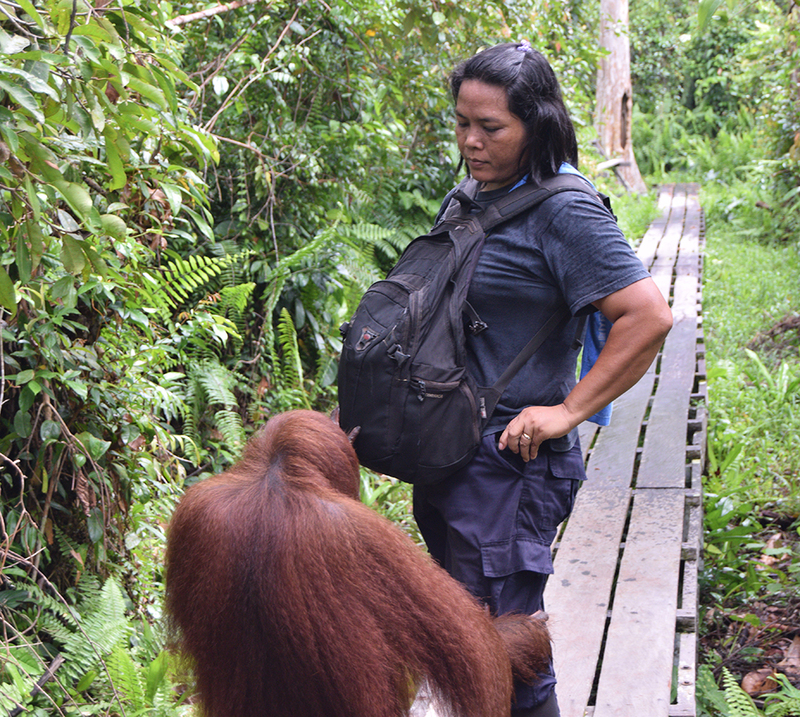 Now they had decided it was time to go home.” Not wanting to be left behind, the orangutans hopped onto the backs of Ibu Ijun and her fellow caregivers as she trekked through the mud back to the orangutans’ sleeping enclosures. How nice to see this lovely story about Ibu Ijun. She is so dedicated to the orangutans, and I feel very fortunate to know her! With a Biology degree and also an MD degree, My life interest as been “Primate Biology”, with my favorite being the Orangutan and Chimpanzee. I have worked with young chimps in the military for several years. My question is: Does your organization have a yearly calendar with pictures of different Orangutans each month? I would be happy to give a donation to your worthy cause. Love this profile and Ibu Ijun’s story of the orangutans! Great work!! !